Fill the room with the aroma of lavender and rose. Each carefully selected ingredient contributes to the home spa experience designed to transform your tub or shower into your own personal spa sanctuary. Anticipate vibrant, rejuvenated and relaxed skin from the top of your head to the tip of your toes. This Spa Tower brings it home. Next time you need a spa day take it home with you. 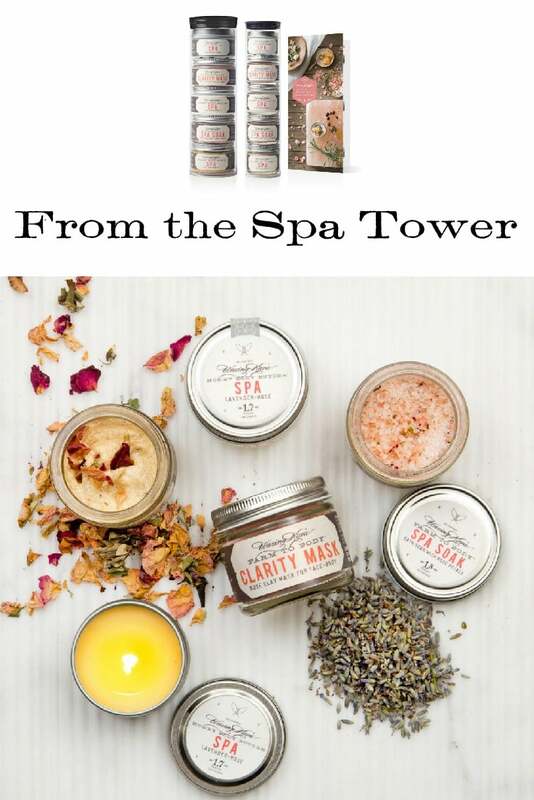 Sit back, relax, and take care of yourself from the comfort of your own home with “From the Spa Tower”. 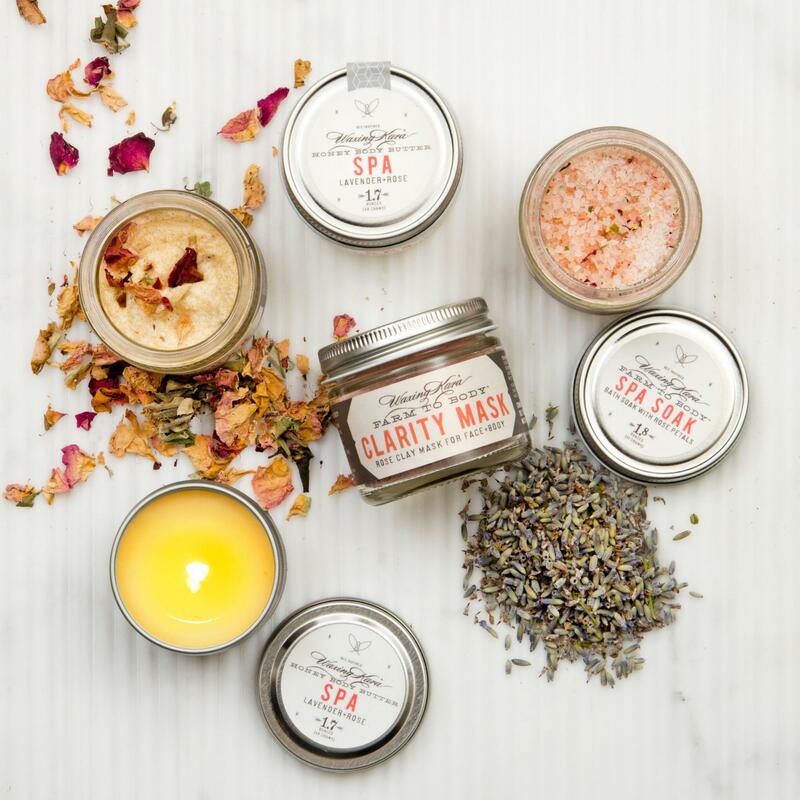 Our Spa line of products features essential oils of rose, lavender, and geranium to soothe, ease and relax the body and mind. Made with plant-derived ingredients like plant butters, honey, and essential oils and free from artificial fragrances, parabens, sulfates, and petroleum ingredients. Spa Candle: rose and lavender scented, this candle creates a warm, deeply moisturizing body oil as it burns. 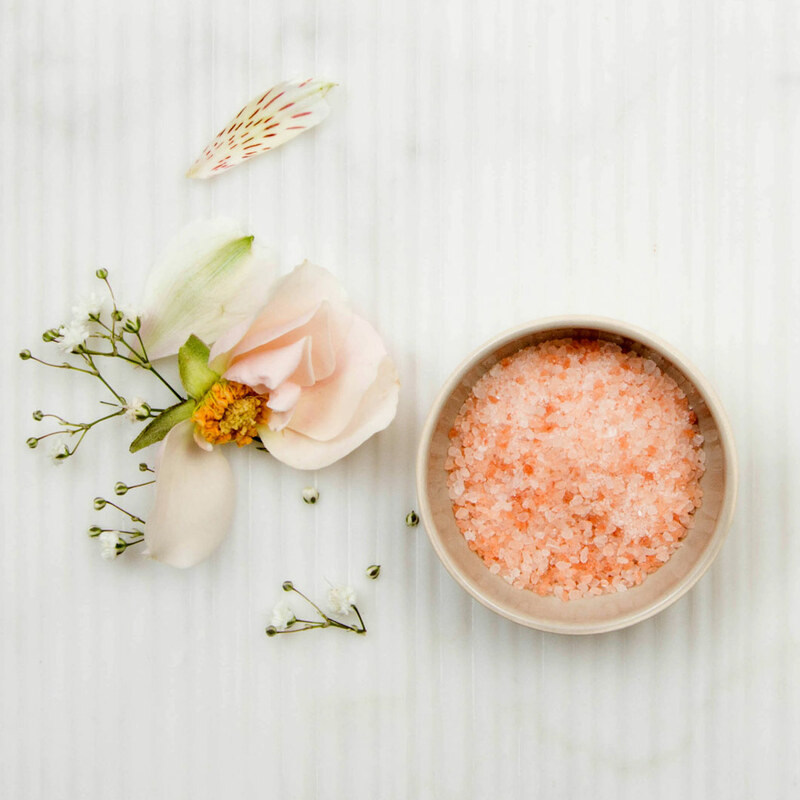 Spa Soak: pink mineral salt and other salts, in tandem with essential oils of lavender, rose and geranium will have you feeling new in no time. Clarity Mask: a real treat for skin and is especially for detoxification. 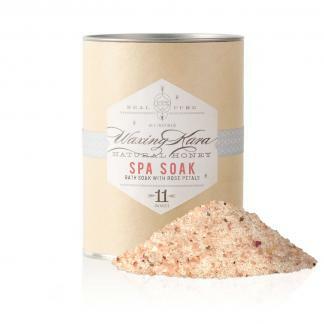 Spa Scrub: designed to cleanse and exfoliate leaving skin as smooth as silk. Spa Butter: glides onto skin as it soothes and smoothes. Step 1 – Dry Brush the entire body to warm the skin and prepare it for detoxification. Light our Spa Candle to get the oils melting, which you will later use in this treatment protocol. Step 2 – Soak in warm water enriched with Waxing Kara™ Spa Soak. Sodium and potassium levels are well-kept secrets to both physical health and mental well-being. They influence the fluid balance in the body, which is regulated by the Adrenal gland, which in turn affects the healthy function of the kidneys. A far-reaching domino effect is ignited in the body when sodium and potassium levels are skewed. Soaking in Mineral Salts helps restore balance, fortifying your well-being as they coax you into relaxation. Although Mineral salt is renowned for its medicinal qualities, we strongly recommended a consultation with a qualified physician before using our products for treatments of Psoriasis, Arthritis, Atopic Dermatitis, Eczema or any other skin disorder. Step 3 – Cleanse and exfoliate with our brand new Waxing Kara Spa Scrub. 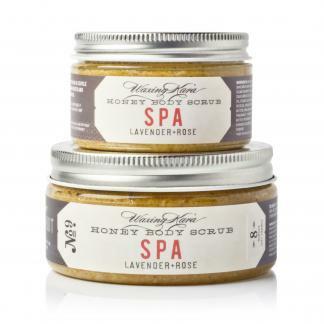 We’ve blended organic honey crystals with shea and cocoa butters to create a deliciously rich exfoliant system that nourishes the skin while ground rose petals, rose hips pulp and honey crystals assist in sloughing expired cells to reveal fresh, healthy tissue. Step 4 –Fortify and protect with Waxing Kara Clarity Mask. Our Clarity Mask is made with white kaolin clay, coconut milk, honey, buttermilk and rose kaolin clay. Kaolin clay is known for detoxification without being too harsh. Exfoliate and detoxify your face and body with this amazing mask. Highly recommended for problematic blemishes and oily skin as it draws oil from the skin, combating grease and dirt while also soothing. Use the mixer of your choice based on skin type. Paint freshly blended mask onto skin and allow remaining for 10-15 minutes. Rinse with warm water or warm towels and towel dry. We recommend treating yourself to a petite facial with this mask or a gentle foot massage as you relax and the face and body mask works its magic. Step 5 – Massage freshly cleansed skin and be sure to get all the dry patches and parts (heels, knees and elbows) with the oil from our beautiful Spa Candle. Finish up with our Spa Butter. Lock in all of these important nutrients and seal the skin with Spa Butter which features honey, cocoa butter, and sweet almond oil. The result is skin that’s as smooth as you can possibly imagine. Step 6 – Relax: Pour a cup of herbal tea and sweeten with our raw Eastern Shore Honey. Listen to inspiring music. Relax your body and mind.